The next Glastonbury Festival takes place from 26th-30th June 2019. Tickets will go on sale in October, more details below. To buy tickets for Glastonbury, you need to register. As part of the Festival’s continued commitment to green travel, 15,000 coach + ticket packages will – as in previous years – be sold in advance of the general sale. These coach + ticket packages will go on sale at 6pm BST – Thursday, 4th October 2018, via glastonbury.seetickets.com, rewarding green travellers with the chance to be the first to secure their Glastonbury 2017 tickets. 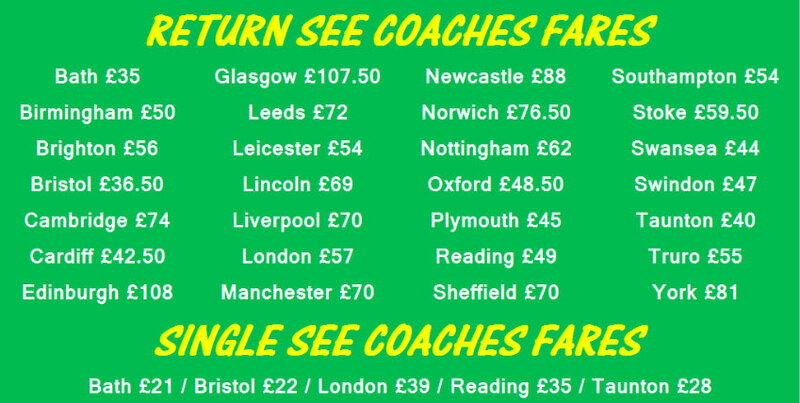 The full cost of the coach will be paid, along with a £50 deposit for the Festival ticket. Coach details below. Standard weekend tickets will go on sale at 9am BST on Sunday, 7th October 2018. As in previous years, tickets will be sold exclusively at glastonbury.seetickets.com. Tickets will cost £248 + £5 booking fee per ticket. You may book up to six tickets per transaction by paying a deposit of £50 per person, with the balance due in April 2019. There are 135,000 tickets up for grabs for Glasto in 2019, that may sound like a lot but demand in recent years as simply outstripped supply. If you have decided to go to the festival for the first time, you must make sure you register. Registration requires some basic contact details and uploading a “passport-standard” photo. Once the photo has been approved, registers are sent a unique registration number that will need to be quoted to book a ticket. As part of Glastonbury’s ongoing efforts to cut out ticket touting, anyone who would like to attend the Festival will need to have registered in order to buy a ticket. See Tickets is the only ticket agency permitted to sell tickets for Glastonbury Festival. No other site or agency will be allocated tickets. Any other company or individual claiming to sell Glastonbury Festival tickets is bogus. Registration does not guarantee you a ticket in the sale, but if you don’t register you will not be able to buy a ticket for Glastonbury Festival 2019. No acts have been confirmed for the 2019 festival yet but as usual, there are plenty of rumours already with Arctic Monkeys, Kendrick Lemar, Paul McCartney, Fleetwood Mac, The 1975, Stormzy, Hacienda Classical, Kylie, Diana Ross, Beach Boys and Liam Gallagher being tipped. Transfer all ticket money into one account, remember only six tickets per transaction. Share the details of the bank account with all the people that are trying to get tickets. Be persistent, patient, and calm! If there is a group of you trying to get tickets make sure you have everyone’s registration numbers and postcodes. Arm your self with a laptop, tablet and phone and use as many IPs as possible. There is strength in numbers! Have different devices on different internet connections trying for tickets. Keep hitting F5 to refresh until you see the booking page. Past advice from Glastonbury Festival has been to stick to one tab in one browser window. Keep in touch using Whatsapp, Facebook etc.